The greatest play I’ve ever seen was one of the last games of the 1966-67 season and were playing Baltimore. We [Philadelphia] were going for the best record in NBA history. There was a play earlier in the game where Gus Johnson had dunked one over Wilt. Gus was a very strong player. I weighed 220 pounds, and with one hand Gus could push me out of the lane. The man was a physical specimen [6-foot-6, 230 pounds], all muscle. He loved to dunk and was a very colorful player. When he slammed it on Wilt, he really threw it down, and you could tell that Wilt didn’t like it one bit. Later in the game, Gus was out on the fast break, and the only man between him and the basket was Wilt. He was goin to dunk on Wilt–again. Gus cupped the ball and took off–he had a perfect angle for a slam. 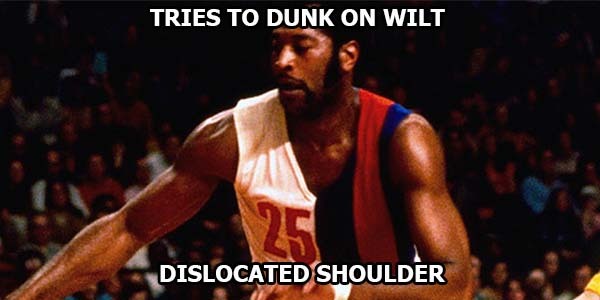 Wilt went up and with one hand he grabbed the ball–cleanly!